The first commercially available 3D printer for fluidically-sealed devices, it offers rapid, easy and reliable printing from as little as $1 per device. Using FDA-approved, robust and translucent cyclic olefin copolymer (COC), this makes it easy and affordable to 3D print devices for almost any application. 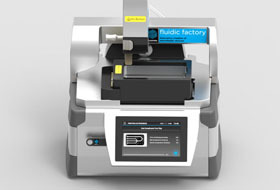 The Fluidic Factory is designed for ultimate ease of use, enabling rapid prototyping of fluidically-sealed devices such as chips, sensor cartridges, fluid manifolds, valves, connectors and medical devices. Its intelligent software and innovative hardware ensure reliable sealing of fluidic paths, allowing the creation of precise channel geometries and various features not possible using etching, embossing, moulding or machining techniques.